Some people like to go away for the Fourth of July-and why not? It’s the peak of the summer season and the weather can’t be beat. Other people however, have discovered that staying close and having their celebration at home can be just as fun, just as memorable, and a little easier on the wallet. In fact, you can make your Fourth of July party even more special (and a lot less stressful) by renting the things that you need. No matter the weather, size of your event, or particular needs of your expected guests, renting can get it done for you. For your basic party needs such as tables, chairs, dishes, and serving equipment, you can rent as much as you need for the number of guests you plan on inviting. If the weather is somewhat less than celebratory, don’t worry, we’ve got you covered. Literally. Tents and canopies are available to keep your party going in even the dreariest of weather. But even if the weather is nice, your guests will still need a break from the sun. Our tents and canopies will give them the shade that they need. Fans and tent air-conditioners are available as well, in the chance that it will be a scorcher. For the unique things that make a party “a party”, consider sound equipment or even a dance floor. For the kids, inflatables are a great way to keep them occupied. Choose from bounce houses, slides, climbing walls, bungee runs, and more. They’ll have a blast while being safe at the same time. For kids of all ages, why not inject a little fun and competition into your celebration and rent a dunk tank, volleyball net or even a tug-of-war rope? You may have the burgers and dogs covered, but why not create a little old-fashioned carnival atmosphere for your Fourth of July celebration and rent your very own concession equipment? Sno-cone and cotton candy machines are just a couple choices. You will be making your party unique, while at the same time creating memories that the kids will talk about for a long time. 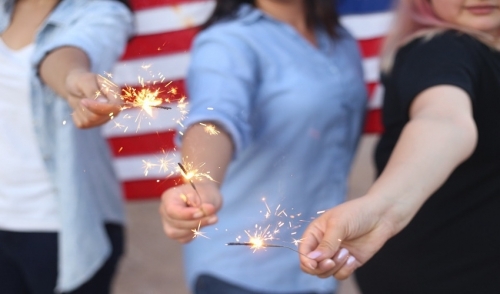 If you’d like to stay home this year and celebrate your Independence Day with family and friends, give us a call and we’ll do all we can to make your Fourth of July fun, fresh and memorable. Our friendly and experienced staff will be happy to help you with whatever you need. © 2019 Taylor Rental Center of Depew, NY. All rights reserved.